The aroma is of the blood orange along with rose water. There is a hint of malt in the back. The pie is more like a panda cotta with a blood orange topping that’s more of a soft jelly and the bottom is a Greek yogurt bottom but is more like eating Skir. The flavor of the bottom is tart lemon with a milk base but does have hints of vanilla and orange through out. Together it’s like eating a tart 50/50 bar. The drizzle of turmeric and ginger is spot on and could have been used more on this as a great flavor booster. The Pie had a great flavor but the crust is lacking. The drizzle helps the crust if you mix them but alone the crust is a fail. The filling of the yogurt is to much and does distract from the blood orange topping. 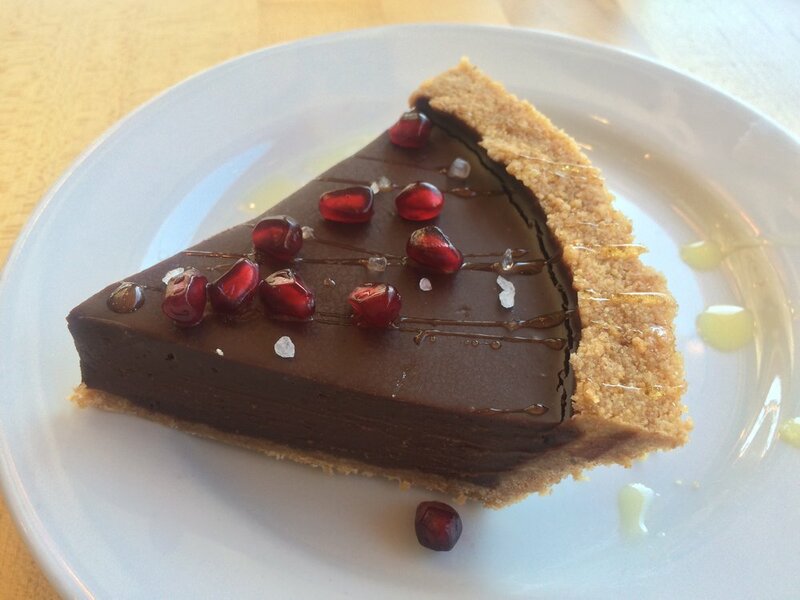 The Salted Chocolate pie is seasonal and is made with a chocolate Cream with a pretzel crust. It is topped with Olive Oil, Sea Salt and Pomegranate Seeds. The filling is firm and very sooth with a rich and decadent texture. The crust is is solid and has a nice crisp texture with lots of salt and does help cut the rich chocolate. The olive oil topping is not really there except for the pomegranate seeds. The filling is sweet to the point its to sweet and has the taste if Dolce de leche along with the texture of flan. There is notes of toasted brown sugar along with a cirrus note of orange blossom and marshmallow. There is a back note of fulr de sal that is very strong. The topping is just honey that has been made into a thin liquid and is ok but nothing special. The salt on top is not even noticeable to see or taste. This Key Lime Pie is great and one of the top 5 I have ever had in custard flavor! The frosting was separated and was grainy with lots of liquid around it and had no flavor. The crust is crisp with a noticeable brown sugar presence and taste. The is not much of a graham cracker taste. It is thick and does hold up to the filling but also lacks flavor. The filling has a deep lime taste through out. It is sour livening a dry feeling in the back of your mouth. It is creamy and velvety with no taste but the lime. It is firm but still pliable and was cooked and set perfectly. I do not think it was make with key lime but regular lime. The Strawberry Rhubarb is more rhubarb then strawberry. 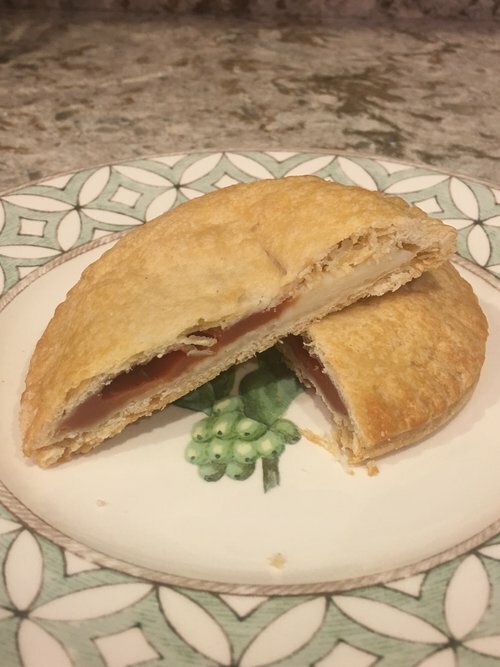 The filling is tart with chunks of rhubarb through out but no strawberry. There is a big note of citrus juice like of lemon. There was no noticeable strawberries in this at all and could have used it to cut the tartness. 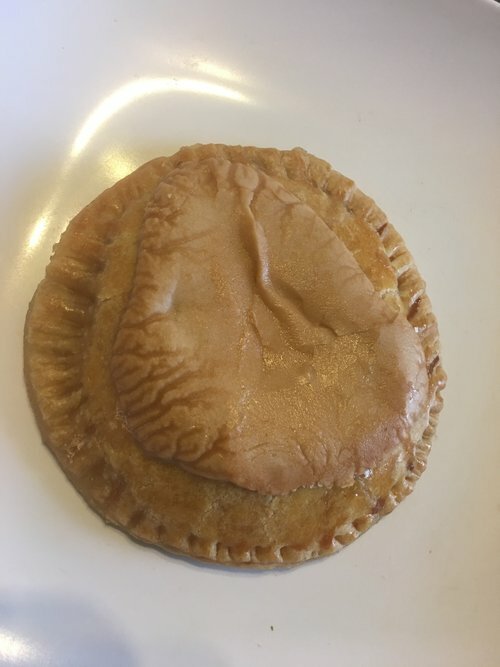 The crust is doughy with not any real flakes on it. It s very buttery and does not taste like it was cooked through. The pie is a good size with a brown caramel sugar topping and a lemon curd filling. The combination is a good but the dough is too much with the filling needed to be more. There is a tart note from the dough with give I gritty finish and needing some water. This pie uses guava jelly on one side and cream cheese on another side of the pie. The jelly is tart with the quintessential guava flavor but you can tell there is more sugar or high fructose corn syrup the guava in it. The cheese is sweet and is much like a blintz filling with an icing consistency. Together they meld together well together blending toe sweet and tart. This pie is made with strawberry jam and have a lavender frosting. The strawberry is a jelly that is overly sweet. There is no chunks of strawberry in this at all and a big disappointment. 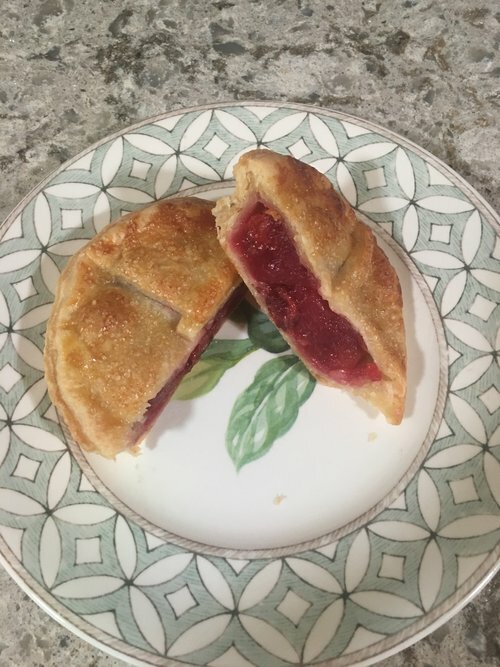 The lavender is only in the frosting and does help cut the sweetness of the strawberry but it is still so sweet along with the lavender is in flowers so there a crunch when to me should have been in a powder and incorporated through out the pie. This pie is made with cherries, cherry jam and thats all. The crust is doughy with a great flakey texture. The Cherries are sweet with a jam made I am guessing from the juice making it tart. The whole pie is filled with whole cherries and some are over cooked and some under making a nice aray of textures and flavors of cherry. Together the jam and the whole cherries become slightly sour but in the best kind of way. The top of the pie crust is covered in corse sugar giving the added texture with a crunch. The blueberries are sweet and there are a few tart ones with a subtle slice note through out like of all spice. The blueberries have a consistency more of a marmalade and the juice is very smooth like jello feel. The crust is flakey and very buttery but still there is a dry note and is sour also in the dough. This is always a crowd pleaser but this one is missing the acidity like of lemon that is much needed to cut the sweetness. This pie is made with an Earl Grey tea infused white chocolate mousse with a layer of dark chocolate ganache and topped with house made whipped cream and pistachios. This savory pie is made with Brussel sprouts, golden beets, mushrooms, cauliflower, pees. First off this pie is spicy and has way to much spices making them over powering the whole pie. The brussel sprouts are mostly the leaf that is peppery as it should be along with a whole one that is more steamed then added. The cauliflower is cooked very well thinking its most likely steamed then blanched then roasted so it keeps the texture and stays firm. The feta is firm and does not melt. It does gather all the spice and when eating it makes your mouth burn then get dry fast. This would be a good pie if they could execute it well but as of now it should be fixed and not should out to the public.